MILICEVIC, M. , BARANOVIC, M. , ZUBRINIC, K.
This paper analyzes the relationship between the system load/throughput and the query response time in a real Online transaction processing (OLTP) system environment. Although OLTP systems are characterized by short transactions, which normally entail high availability and consistent short response times, the need for operational reporting may jeopardize these objectives. We suggest a new approach to performance prediction for concurrent database workloads, based on the system state vector which consists of 36 attributes. There is no bias to the importance of certain attributes, but the machine learning methods are used to determine which attributes better describe the behavior of the particular database server and how to model that system. During the learning phase, the system's profile is created using multiple reference queries, which are selected to represent frequent business processes. The possibility of the accurate response time prediction may be a foundation for automated decision-making for database (DB) query scheduling. Possible applications of the proposed method include adaptive resource allocation, quality of service (QoS) management or real-time dynamic query scheduling (e.g. estimation of the optimal moment for a complex query execution). M. Milicevic, M. Baranovic, V. Batos, "QoS control based on query response time prediction", WSEAS Transactions on Computers. 4 (2005), 882-889. M. Wimmer, V. Nicolescu, D. Gmach, M. Mohr, A. Kemper, H. Krcmar, "Evaluation of Adaptive Computing Concepts for Classical ERP Systems and Enterprise Services", Proceedings of IEEE Joint Conference on E-Commerce Technology and Enterprise Computing, E-Commerce and E-Services (CEC'06 and EEE'06), San Francisco, California, June 26-29, 352-355. B. Shneiderman, Designing the User Interface: Strategies for Effective Human-Computer Interaction, 3rd ed., Addison-Wesley, Reading, MA, 1998. R. B. Miller, "Response time in man-computer conversational transactions", Proceedings of AFIPS Fall Joint Computer Conference, Vol. 33, 1968, 267-277. J. Nielsen, Usability Engineering, Morgan Kaufmann, San Francisco, 1994. R. McNab, Y. Wang, I.H. Witten, C. Gutwin, "Predicting query times", Proceedings of the 21st Annual international ACM SIGIR Conference on Research and Development in information Retrieval SIGIR '98. ACM Press, New York, 1998, 355-356. S. Heisig, S. Moyle, "Using model trees to characterize computer resource usage", Proceedings of WOSS 2004, 80-84. P. Dinda, D. O'Hallaron, "The Statistical Properties of Host Load, Fourth Workshop on Languages", Compilers and Run-time Systems for Scalable Computers (LCR 98), Pittsburgh, 1998. P. Dinda, D. O'Hallaron, "An Evaluation of Linear Models for Host Load Prediction", Proc. 8th IEEE Symposium on High-Performance, Distributed Computing (HPDC-8), Redondo Beach, 1999. P. Dinda, D. O'Hallaron, "Host load prediction using linear models", Cluster Computing, 2000. P. Dinda, "A Prediction-based Real-time Scheduling Advisor", Proceedings of the 16th International Parallel and Distributed Processing Symposium (IPDPS 2002), 2002. M. Andreolini, S. Casolari, "Load prediction models in web-based systems", Proceedings of the 1st international Conference on Performance Evaluation Methodolgies and Tools, New York: ACM Press, 2006. W. Xu, X. Zhu, S. Singhal, Z. Wang, "Predictive Control for Dynamic Resource Allocation in Enterprise Data Centers", 10th IEEE/IFIP In Network Operations and Management Symposium, (2006). 115-126. R. Vilalta, C.V. Apte, J.L. Hellerstein, S. Ma, S.M. Weiss, "Predictive algorithms in the management of computer systems", IBM Systems Journal Vol. 41, No 3, 2002. S. Cronen-Townsend, Y. Zhou, W.B. Croft, "Predicting query performance", Proceedings of the 25th Annual International ACM SIGIR Conference on Research and Development in Information Retrieval, Tampere, Finland, 2002. B. He, I. Ounis, "Query performance prediction. Information Systems", Special Issue for the String Processing and Information Retrieval (SPIRE2004), 2005. C. Hauff, L. Azzopardi, D. Hiemstra, "The combination and evaluation of query performance prediction methods", Lecture Notes in Computer Science, Volume 5478, 2009. 301-312. J. Perez-Iglesias, L. Araujo, "Evaluation of Query Performance Prediction Methods by Range", Proceedings of the 17th edition of the Symposium on String Processing and Information Retrieval, 2010. N. Tomov, E.W. Dempster, M.H. Williams, J.B. King, A. Burger, "Approximate Estimation of Transaction Response Time", Comput. Journal, 42(3) (1999).241-250. D.A. Menascé, R. Dodge, D. Barbara, "Preserving QoS of E-Commerce Sites through Self-Tuning: A Performance Model Approach", Proceedings of 2001 ACM Conf. E-Commerce, ACM Press, 2001. 224-234. D.A. Menascé, "Automatic QoS Control", IEEE Internet Computing 7(1) (2003). str. 92-95. P. Martin, W. Powley, H. Li, K. Romanufa, "Managing database server performance to meet QoS requirements in electronic commerce systems", International Journal on Digital Libraries 3(4), 2002, 316-324. B. Mozafari, C. Curino, A. Jindal, S.l Madden, "Performance and resource modeling in highly-concurrent OLTP workloads", Proceedings of the 2013 ACM SIGMOD International Conference on Management of Data (SIGMOD '13). ACM, New York, 2013, 301-312. B.Mozafari, C. Curino, S. Madden, "DBSeer: Resource and Performance Prediction for Building a Next Generation Database Cloud", CIDR, 2013. M. Ahmad, I. Bowman, "Predicting system performance for multi-tenant database workloads", Proceedings of the Fourth International Workshop on Testing Database Systems (DBTest '11). ACM, New York, 2011. C. Gupta, A. Mehta, U. Dayal, PQR: "Predicting Query Execution Times for Autonomous Workload Management", Proceedings of the 2008 International Conference on Autonomic Computing, 2008.13-22. A. Mehta, C. Gupta, U. Dayal, "BI batch manager: a system for managing batch workloads on enterprise data-warehouses", Proceedings of the 11th international conference on Extending database technology: Advances in database technology, 2008. A. Ganapathi, H.A. Kuno, U. Dayal, J. L. Wiener, A. Fox, M. I. Jordan, D. A. Patterson, "Predicting Multiple Metrics for Queries: Better Decisions Enabled by Machine Learning", Proceedings of the 2009 IEEE International Conference on Data Engineering, 2009. pp 592-603. S. Krompass, A. Scholz, M. Albutiu, H. Kuno, J. Wiener, U. Dayal, A. Kemper, "Quality of Service-Enabled Management of Database Workloads", IEEE Data Engineering Bulletin, Special Issue on Testing and Tuning of Database Systems, 31(1), 2008. S. Krompass, H.A. Kuno, K. Wilkinson, U. Dayal, A. Kemper, "Adaptive query scheduling for mixed database workloads with multiple objectives", Proceedings of the Third International Workshop on Testing Database Systems, DBTest 2010. M. Akdere, U. Çetintemel, M. Riondato, E. Upfal, S. Zdonik, "Learning-based Query Performance Modeling and Prediction", Proceedings of the 2012 IEEE 28th International Conference on Data Engineering (ICDE '12). IEEE Computer Society, USA, 390-401. M. Ahmad, A. Aboulnaga, S. Babu, "Query interactions in database workloads", Proceedingsof the Int. Workshop on Testing DatabaseSystems (DBTest), 2009. M. Ahmad, S. Duan, A. Aboulnaga, S. Babu, "Interaction-aware prediction of business intelligence workload completion times", International Conference on Data Engineering (ICDE), 2010, 413-416. 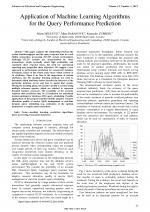 J. Duggan, U. Cetintemel, O. Papaemmanouil, E. Upfal, "Performance prediction for concurrent database workloads", SIGMOD, 2011. Y. Lingyun, I. Foster, J. M. Schopf, "Homeostatic and tendency-based CPU load predictions", Parallel and distributed processing Symposium, 2003. H. Li, D. Groep, L. Wolters, "Efficient response time predictions by exploiting application and resource state similarities", 6th International Workshop on Grid Computing (GRID 2005), 2005. W. Smith, I. T. Foster, V. E. Taylor, "Predicting application run times with historical information", Journal of Parallel Distrib. Comput., 64(9) (2004).1007-1016. J. R. Quinlan, "Learning with Continuous Classes", Proceedings of Fifth Australian Joint Conf. Artificial Intelligence, Australia,1992. Y. Wang, I.H. Witten, "Inducing model trees for continuous classes", Proceedings of Poster Papers, 9th European Conference on Machine Learning, Prague, Czech, 1997. G. Holmes, M. Hall, E. Frank, "Generating Rule Sets from Model Trees", Twelfth Australian Joint Conference on Artificial Intelligence, 1-12, 1999. I. H. Witten, E. Frank, Data Mining: Practical machine learning tools and techniques, 2nd Edition, Morgan Kaufmann, San Francisco, 2005. D. Aha,D. Kibler, M. Albert, "Instance-based learning algorithms", Machine Learning 6 (1991), 37-66. D. Rumelhart, G. Hinton, R. Williams, "Learning Internal Representations by Error Propagation", Parallel Distributed Processing Vol.1 (1986), Cambridge, MA, MIT Press. 318-362. J. Han, M. Kamber, Data Mining. Morgan Kaufmann, San Francisco, CA, 2001. S. K. Shevade, S. S. Keerthi, C. Bhattacharyya, K. R. K. Murthy, "Improvements to the SMO Algorithm for SVM Regression", IEEE Transactions on Neural Networks, 1999. R. Kohavi, "A study of cross-validation and bootstrap for accuracy estimation and model selection", Proceedings of the 14th International Joint Conference on Artificial Intelligence, Morgan Kaufmann, San Francisco, 1995. V. Barnett, T. Lewis, Outliers in Statistical Data, 2nd ed., John Wiley & Sons, 1987. E. Knorr, R. Ng, "A unified notion of outliers: Properties and computation", Proceedings of 1997 Int. Conf. Knowledge Discovery and Data Mining (KDD'97), Newport Beach, CA, 1997. E. Knorr, R. Ng, "Algorithms for mining distance-based outliers in large datasets", Proceedings of 1998 Int. Conf. Very Large Data Bases (VLDB'98), New York, 1998. L. Breiman, "Bagging Predictors", Machine Learning, 24(2), 1996, 123-140. Y. Freund, R.E. Schapire, "Experiments with a new boosting algorithm", Proceedings of the Thirteenth International Conference on Machine Learning / editor L. Saitta. Bari, Italy. San Francisco: Morgan Kaufmann, 1996, 148-156. R. E. Schapire, Y. Freund, P. Bartlett, W. S. Lee, "Boosting the margin: A new explanation for the effectiveness of voting methods", Proceedings of the Fourteenth International Conference on Machine Learning / D. H. Fisher, editor. Nashville, TN. San Francisco: Morgan Kaufmann, 1997, 322-330. E. Frank, Y. Wang, S. Inglis, G. Holmes, I. H. Witten, "Using model trees for classification", Machine Learning, 32 (1998), 63-76. T. Fawcett, "ROC Graphs: Notes and Practical Considerations for Data Mining Researchers", Technical Report HPL-2003-4, HP Labs, 2003. I. Kononenko, "Estimating attributes: analysis and extensions of Relief", Proceedings of the European Conference on Machine Learning: ECML-94. / De Raedt, L., Bergadano, F., editors. Springer Verlag, 1994. 171-182. M. Robnik Sikonja, I. Kononenko, "An adaptation of Relief for attribute estimation on regression", Proceedings of 14th International Conference on Machine Learning ICML'97 / D.Fisher editor. Nashville, TN. 1997. H. Liu, J. Li, L. Wong, "A Comparative Study on Feature Selection and Classification Methods Using Gene Expression Profiles and Proteomic Patterns", Proceedings of 13th International Conference on Genome Informatics (GIW02), Tokyo, Japan, 2002. M. A. Hall, "Correlation-based feature selection machine learning", Ph.D. Thesis, Department of Computer Science, University of Waikato, Hamilton, New Zealand, 1998. M. A. Hall, L. A. Smith, "Feature selection for machine learning: Comparing a correlation-based filter approach to the wrapper", Proceedings of the 22nd Australasian Computer Science Conference, 1999. 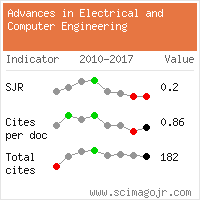 Citations for references updated on 2019-04-22 00:25 in 251 seconds. Website conception, design and maintenance by Eugen COCA. Content updated on 28 Feb 2019. Site engine updated on 28 Feb 2019. This page was generated on the server in 0.033 seconds and loaded in your browser in > seconds.